Fish tacos are one of my favorite easy, healthy dinners. They are also a perfect warm weather dinner. As we were eating these we talked about how fun it would be to entertain with a make-your-own fish taco bar and margaritas or sangria. Just might have to do that soon! Another great thing about fish tacos is that they can be totally customized based on your flavor and topping preferences. We happen to love ours finished with this Baja Cream that I discovered when I was making these shrimp tacos. I like to serve all of the toppings on a big platter so we can each build our own tacos. 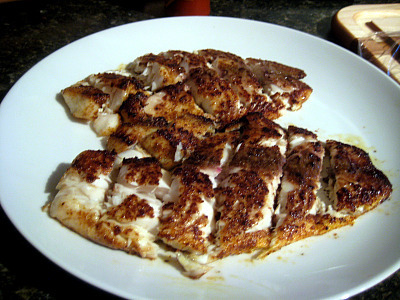 I usually use a mild white fish and saute it with a Dizzy Pig rub like Jamaican Firewalk or Shakin’ the Tree. If you’ve been reading my blog for a while you should be familiar with these rubs. I can’t sing The Dizzy Pig’s praises enough. These rubs have the best flavor and use high quality ingredients. Also, their customer service is awesome! 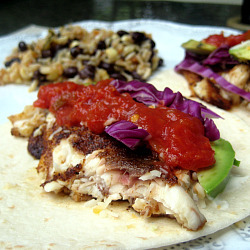 I’m sharing my base recipe for fish tacos but feel free to change it up to meet your tastes. But whatever you do, don’t skip out on the Baja cream – even if you’re not a mayonnaise fan – it sounds so simple but adds a wonderful, bright flavor to the tacos. Drizzle fish with olive oil and coat with seasoning rub. In a large, nonstick pan over medium-high heat, heat olive oil. Add fish and cook about 3 minutes per side or until internal temperature reaches 145 degrees. Remove fish from pan and cut into slices. 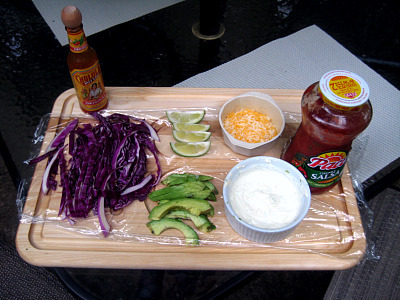 Arrange Baja cream and toppings on a platter and serve with fish and warmed tortillas (I usually wrap mine in a paper towel and microwave for about 30 seconds). First things first, let me apologize profusely for the quality of this picture. Unfortunately, dinner wasn’t ready until it was dark outside so I was forced to shoot these in the harsh, unflattering light of my kitchen. But these shrimp tacos were just too delicious not to share! I have been craving shrimp tacos for the last couple weeks. I couldn’t really find a recipe that sounded perfect to me so I just kind of went for it. I decided to do grilled shrimp with a spicy jerk rub, shredded cabbage, salsa, cheese and this great Baja cream that I found on Epicurious. The combination turned out great. The flavors went together really well. The Baja cream balanced out the spiciness of the jerk grilled shrimp and the cabbage added just the right crisp to the tacos. And to top it off, they were pretty healthy! I served these with black beans and rice (recipe to come on the blog soon!) and grilled corn. Perfect summer meal! Mix together mayonnaise, sour cream, lime zest, lime juice and salt for Baja cream. Refrigerate at least 30 minutes to let flavors develop. Preheat grill to medium heat (around 400 degrees). Place shrimp in a bowl and drizzle with olive oil. Toss to coat lightly. Generously shake Jerk rub over the shrimp and toss to coat. Place shrimp on skewers. Spray grill grate with cooking spray and place shrimp and grill. Cook for about 2 minutes per side or until pink and no longer translucent. Wrap tortillas in a paper towel and heat for about 45 seconds in the microwave. Place grilled shrimp (I did about 4 per taco) on tortillas and then top with cabbage, salsa, Baja cream and cheese. Bacon…cheese…chicken…BBQ sauce…all wrapped up together and grilled. What’s not to love about that combination? Brandon got the idea for this chicken from the Egghead forum a few months ago when I put him in charge of figuring out what to do with chicken breasts for dinner. I was super impressed by how great he did creating this. If you’re a bacon lover, this is a MUST try on the grill during the upcoming warm months. 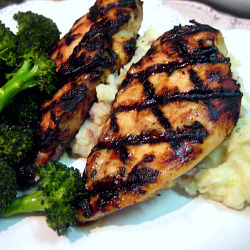 Pound out chicken breasts (in a plastic bag or between two sheets of wax paper) to about 1/4 inch thickness. Coat the top of chicken with grill rub. Turn over so rub side is down on work surface. 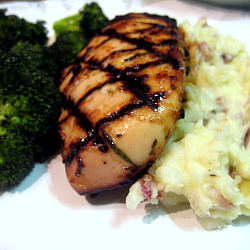 Spread one teaspoon of barbeque sauce in a thin layer over each chicken breast. Layer cheese in the middle of the chicken. Roll chicken tightly. Wrap with bacon, using as many slices of bacon as you need and using toothpicks to hold bacon in place. Grill for 20-25 minutes, turning every 4-5 minutes or until internal temperature of chicken breast has reached 165 degrees. Remove toothpicks and serve with barbecue sauce on the side. What to do when you’re “over” the traditional method of preparing things – like baked sweet potatoes – and feeling uninspired? Challenge the husband to come up with something on the grill. Brandon whipped these grilled sweet potato slices up as a side dish last week and they turned out great! I would describe them as a cross between a sweet potato fry and a sweet potato chip. They were coated in olive oil and a spicy jerk rub and had a nice flavor. Try these out for a new sweet potato preparation and a perfect summer grilling side item. Preheat grill to 350 degrees. Coat potato slices in olive oil and generously sprinkle with seasoning rub and kosher salt. Carefully place potato slices on grill. Don’t be alarmed if you lose a few through the grates. If you want to prevent this you can lay foil down on the grate before grilling but you will lose those beautiful grill marks! Grill on medium heat, turning frequently (and carefully!) until slices begin getting grill marks and can be easily pierced. This should take about 12-15 minutes.